BIOS is a software installed in a special small storage on the computer's motherboard. It starts the operating system installed on the PC and performs early initialization of your hardware. Another name for BIOS is 'main board firmware'. UEFI (Unified Extensible Firmware Interface) is a modern version of firmware. It was created as a replacement for legacy BIOS. It overcomes limitations of classic BIOS firmware and make the initial hardware configuration flexible and simple. You can install Windows 10 using a bootable USB flash drive. However, recent builds of Windows 10 come with very large install.wim file which doesn't fit the FAT32 file system. FAT32 is required to boot with UEFI. The only way to place the install.wim file which larger than 4GB on a flash drive is to format it into NTFS. But NTFS formatted drives cannot be used to boot with UEFI. To overcome this issue, you can use Rufus. Download the latest version of Rufus from its official web site. Backup everything important from your USB drive, because all data on the drive will be erased. Run Rufus and select your USB drive under 'Device'. 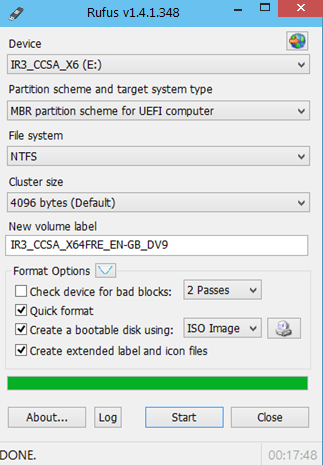 Select the partition scheme for UEFI computers with MBR. If your PC has a GPT partition scheme (GUID Partition Table), then pick the appropriate option from the drop-down list. Click on the CD/DVD drive icon to browse to the Windows 10 ISO image file. Select the Windows 10 ISO image file - 32-bit or 64-bit - whichever you have. After you click the Start button in Rufus, it will create a bootable UEFI USB stick with Windows 10. Modern devices support both BIOS or UEFI firmware modes. However, it can be useful to create a bootable USB driver which works in native UEFI mode.